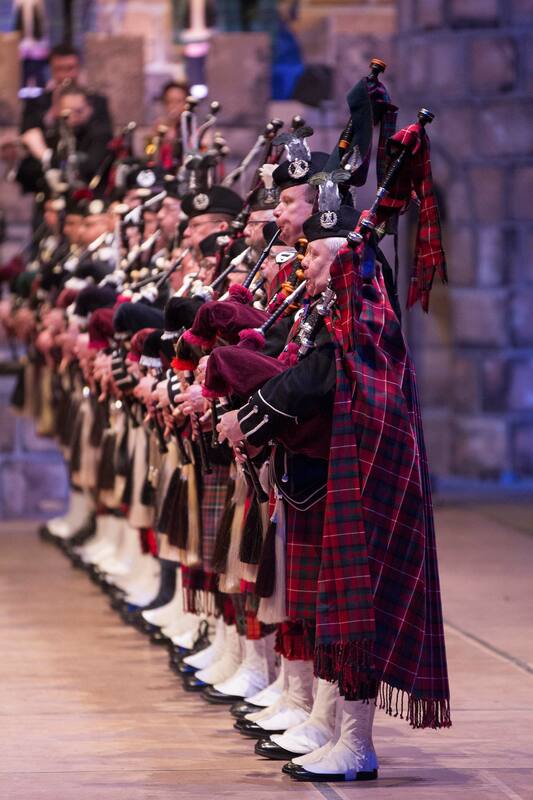 The story | Music Show Scotland | One of the biggest Scottish Music Events of the World - Tickets, Reviews, Video, Pictures and more..
Where does the bagpipe come from, how big is the castle and which bands participate? You can read this and much more below. How long has the show been? Although the bagpipe is usually known as a pure Scottish instrument, it isn't Scottish at all! In Scotland this instrument has although manifested itself through the years as Scottish culture. But where does it actually come from? Is the bagpipe originally a Scottisch instrument? Not a bit of it! The "Great Highland Bagpipe" is the most famous bagpipe, but the instrument has probably come into existance about 2000 years for Christ in India, Pakistan and Iran. It already existed in the old Egypt and Turkey. Because of the journeys of Alexander the Great, die instruments came to the west and during the Roman empire they got spread all over Europe.Even today they are a part of the German, Scottish, Irish, Spanish, Serbian and Albanian music culture. The instrument exists of a leather or synthetic bag, in which are four instruments integrated. Three of them, the "drones", produce a continuous hum. They are cylindrical pipes with a single reed and can be used similar to a clarinet. The conical melody pipe, similar to a recorder, exists of a double reed and is because of that related to a oboe. The hardest thing when playing on it, is that you have to make all pipes sound together, without being able to blow on them separately. This can be accomplished by blowing air in a bag, so pressure will be build, and the pipes will give a sound. The bagpipe player can regulate the pressure with his upper arm and a steady breathing technique. When the pressure is not stable, the sound of the several pipes will differ and the sound becomes unpleasant. Another consequence of this technique is, that it can only be played "legato", or without any breaks in between. Accents by variations in sound intensity or pauses aren't possible. Because of that, little notes are being played, for example "gracenotes", that can seperate several notes from each other. Just playing a couple of notes, like with a piano, is very difficult. You have to blow some air in the bag at first, and the right pressure must be build when the first sound is being produced. Stop playing the instrument is also something to be practiced. The bagpipe player has to push air out of the bag, long before the end of the song, or else it will produce sounds afterwards. The audience doesn't come to only hear something, but they are also offered a visual show. For each show a specially designed castle decorum is brought and build: about 40 meters wide and 15 meter high, with four floors, on which the musicians can stand and play music. When you think of Scotland, you think of the bagpipe, a hilly landscape and.. a castle. That doesn't lack either with the Music Show Scotland. The authentic recreation of a Scottish castle is the center of the show. We are not talking about a printed canvas, no - it is a real decorum with 4 floors, on which you can walk and which are connected by several stairs. The Music Show Scotland has produced this castle all by itself. The castle is about 40 meters wide, is 15 meters high and has a depth of 6,5 meters. 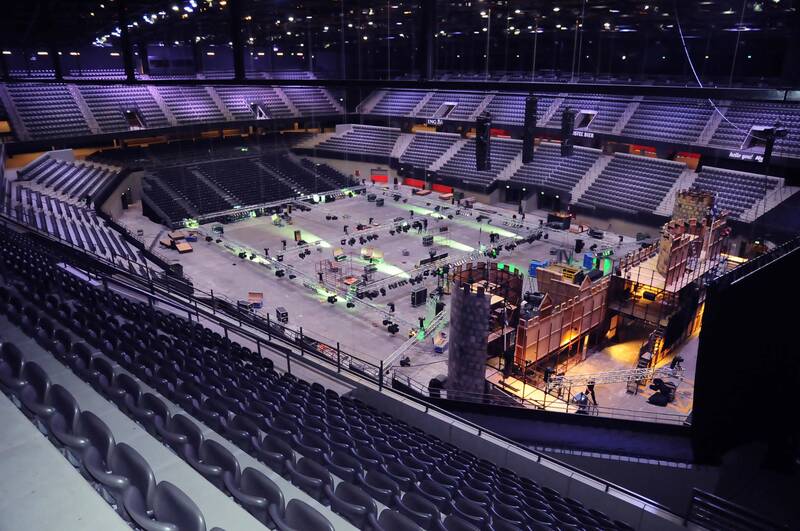 It can be adapted by the size of the venue and is officially TUV tested. Security is always top priority. Important is, that the castle isn't only stable and trustworthy, but also light and detachable. To build the life size castle, 12,5 ton of steel and 12 ton of wood is being used up. You don't need a needle, to build this castle every single time. 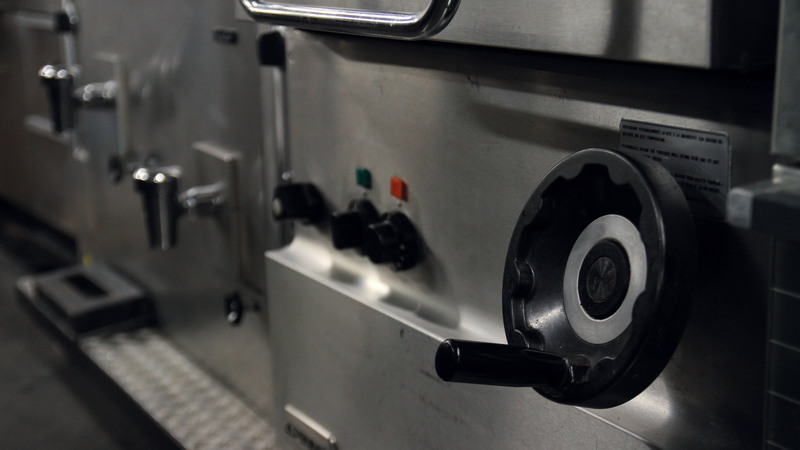 It is easy detachable and is being transported in specially designed containers. The construction team of Music Show Scotland needs a single day, to build the entire castle. But it needs a lot of preparation for that. The Music Show Scotland is always busy developing the castle, lighting and sound. After the show the audience has the opportunity, to get photographed together with a piper or a drummajor in frond of the castle. Right after that, the construction team starts dismantle the castle. At the following morning at 7 o'clock the total package is already packed. At Sunday morning the mobile kitchen will be dismantled and the entire team can return homewards. A busy weekend of the show has come to an end. Music Show Scotland consists of a cast with multiple bands. The Highland Valley Castle gets an additional attraction because of a mega-lightshow and special effects. Music Show Scotland brings its own sound equipment as well. And how do you provide more than 200 musicians and employees with food and drinks? 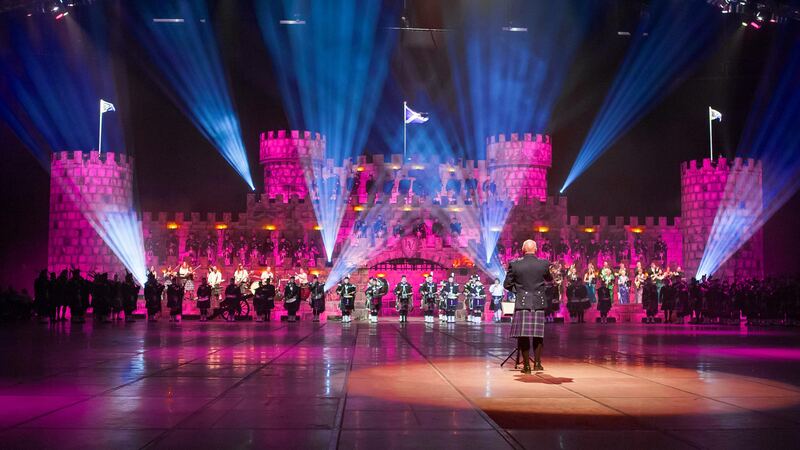 Music Show Scotland has its home base in Borculo (NL) where the castle, the audio and light installation is stored between the shows. All together the lightshow has a capacity of 350.000 watt. Most of the spots hang up high above the grandstand on trusses. Specially trained employees, so called riggers, hang the trusses with chains, ropes, slings and shackles on defined points on the roof. The 26 special electric chain blocks are used to lift and drop the trusses. Total capacity of 18.000 kilos. All together there are 180 meters of truss transported into the air. With its capacity of 30.000 watt, 40 microphones, instruments, in-ear-systems, monitors, 1500 meters of cable and 90 meters of multi cable the sound equipment is complete. But also at our home base we practice with a complete sound equipment. At the home base of Music Show Scotland there is a sound installation for the Highland Valley Castle Band. The practice area is also provided with a studio where the CD of the Music Show Scotland has been recored. After all the hard work there is the opportunity to have a drink in the specially build pub of the building. Once a year this room is also used as a base for the Music Show Scotland Workshop were all pipers and drummers practice new songs together. That isn't only important for the development of the show but also for teambuilding. Most of the venuemanagers are overwelmed and jealous of the little cateringcompany with the mobile equipment of a full-fledged kitchen that Music Show Scotland brings along. What do you actually need for it? Two big steamers, a big baking tray, a enormous cooking-stove, two kettles with which we are able to cook 70 liters of soup, a large deep frier, two double freezers, so big you can stand in it, four enormous fridges, and a bar complete with beer pump and soda-equipment, a coffee-machine, stainless steel worktables and a very own scullery for the dishes. The quantity that is being used for the show are not to be overlooked. For example: for breakfast and lunch, 40 breads, 6 kilos of butter, 5 kilos of sandwich filling as cheese and sausage is needed. And then we are even not talking about the quantity of products used for dinner. Not to forget are all the snacks: hundreds of refreshments like cheese, sausage, salmon, eggs, as well as chips and winegums, but also pieces of apple and pickles make sure that the entire team is fit enough to bring another fantastic show.